Every MICRO CELL product has a differentiated spectrum of activity in order to respond to various stress criteria. This makes MICRO CELL an accurate problem-solver that is guaranteed to work – always. With the highest product quality and innovative compositions based on the latest results in scientific research, we have been convincing our customers for more than three decades. To this day, the unique active system of MICRO CELL has not been beaten. NAIL REPAIR has been specially developed for soft and brittle nails. The unique effect is based on the recovery of protein molecules in the stratum corneum. Damaged nails are strengthened and protected against tearing and splintering of the nail tips. Even after a short application time the nail grows noticeably stronger and more resistant, without loosing its flexibility. NAIL REPAIR is also available as MATT varnish. 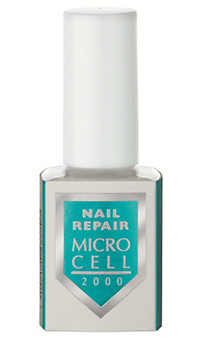 Micro Cell NAIL REPAIR LIGHT & WHITE is available especially for sensitive nails. Protect cuticles with grease or oil and apply one layer of NAIL REPAIR on two consecutive days. On the third treatment day remove all varnish layers with NAIL REMOVER REPAIR and repeat the treatment as on the first and second day. Nail Wonder is a true magic paint for all purposes with 5-fold effect in just one product. 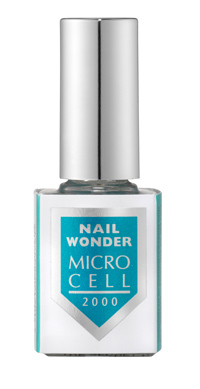 By its extraordinary special formula Micro Cell 2000 NAIL WONDER covers several fields of application at the same time. NAIL REPAIR LIGHT & WHITE is a varnish with half the concentration of active ingredient of Micro Cell 2000 NAIL REPAIR. It was specially designed for all women who have a very thin nail plate or worn artificial nails for a long time and therefore are prone to sensitivities. This active ingredient concentration ensures the same treatment success as NAIL REPAIR and guarantees high tolerance even in case of hypersensitivity. Protect cuticles with grease or oil, and apply one layer NAIL REPAIR LIGHT & WHITE on two consecutive days. On the third treatment day remove all the layers with NAIL REPAIR REMOVER and repeat the treatment as on the first and second day. The treatment should be carried out for 4 - 6 weeks. Then it is recommended to use NAIL REPAIR LIGHT & WHITE 1x weekly as a base coat. For men and those who do not want a visible shine on their nails.With all the special properties of NAIL REPAIR, but "invisible" after application. 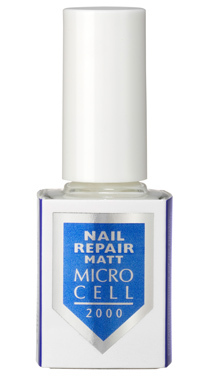 NAIL REPAIR MATT has been specially developed for soft and brittle nails. The unique effect is based on the recovery of protein molecules in the stratum corneum. Thus damaged nails are strengthened and protected against sharp tearing and splintering of the nail tip. Even after a short application time it becomes noticeable that the nails grow stronger and more resistant without loosing its flexibility. Protect cuticles with grease or oil and, apply one layer of NAIL REPAIR MATT on two consecutive days. On the third treatment day remove all varnish layers with NAIL REMOVER REPAIR and repeat the treatment as on the first and second day. The treatment should be carried out for 2 - 3 weeks. Then it is recommended to use NAIL REPAIR MATT 1x weekly as a base coat. NAIL RESCUE OIL contains high-quality plant oils, vitamin A, B5, C, E & F, silica and citral. This unique combination soothes and protects the cuticles from drying out and replaces missing nail oil in the nail plate. The nails are moisturized, well maintained and retain their natural flexibility, which protects against chipping and tearing of the nail tips. Apply on unvarnished and cleaned nails and massage in gently. Before application of nail polishes, wash and dry hands and nails thoroughly. NAIL RESCUE OIL can be applied daily. 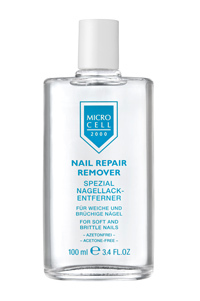 NAIL REPAIR Remover is an acetone-free special remover to positively support any nail treatment. It is especially suitable for soft and brittle nails, removes MICRO CELL 2000 NAIL REPAIR and all nail varnishes particularly gently. Soak a cotton pad or Kleenex with NAIL REPAIR REMOVER and remove NAIL REPAIR every 2 days. For the removal of colored nail polish lay the soaked cotton pad or Kleenex on the nail, press for 10 seconds and easily remove paint as usual. Thus, even intensively liable nail varnish can be easily and quickly removed. 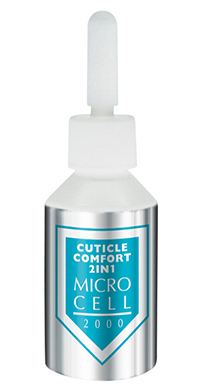 CUTICLE CARE PEN is the perfect complement to the Microcell 2000 products. The practical application in pen form provides optimally maintained cuticles especially on the go, anytime and anywhere. The Cuticle Care Pen contains high quality oils such as peach kernel oil, jojoba oil and rice, which maintain the cuticles gently and promote healthy growth of the cuticle. The cuticle is smooth and elastic. 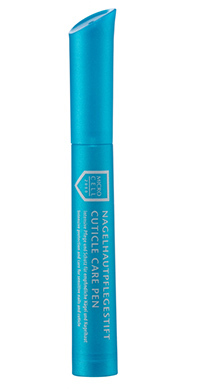 Following Nail Wonder or Nail Repair application maintain the cuticle with the cuticle balm as often as wished. With the tip just go gently along the cuticle and gently push back the cuticles. Protects and cares for the cuticles (e.g. during treatment with NAIL REPAIR) and also loosens them, but does not contain the usual caustic substances. This uniquely gentle cuticle removal product is based on a marine complex of pure sea salt and chitin. Calcium and provitamin B5 keep the cuticle soft and supple and also strengthen the nail bed. Apply a fine strip of gel to the cuticle, leave for 5 minutes. Rub off cuticle or remove with an orange stick. Simply rinse off any traces. Supersonic professional glass file is a glass file that works to prevent splintering and breaking nails. It files with a particularly fine grain and prevents the tips of the nails from splitting. It seals the nail edges by filing very fine cracks and grooves. Use the MICRO CELL Nail Polish Corrector Pen to erase small nail polishing mistakes. The pen is very easy to handle and does not run out. After usage clean tip with a tissue and close pen tightly. To replace the pen tips, simply pull the tip out of the pen and insert a spare tip. Ideal for natural and artificial nails. Acetonfree! With its 3 spare tips, it is particularly handy on the road. Nail care like a professional, no matter when and where.